Radio England and Britain Radio should have been the biggest things to hit the British airwaves in the sixties as, for the first time, two different stations were broadcast from the same ship and both stations catered for different markets. "Swinging Radio England", as the station announced itself, targeted the competitive pop audience with a high-powered Top 40 format while its sister station, Britain Radio, catered for the sweet music/easy listening market. They both failed. Radio England due to a combination of mis-management, and unleashing on the British public a sound they could not identify with - quick-fire American presentation with mostly American DJs, although some British DJs were used but were encouraged to adapt to the American style of presentation. Britain Radio failed due to both management problems and the fact that their easy listening audience had already been captured by sweet music station Radio 390. Both stations were based on board the MV Laissez-Faire, formerly the MV Olga Patricia, an old World War II Liberty ship anchored off Walton-on-the-Naze, Essex, England. 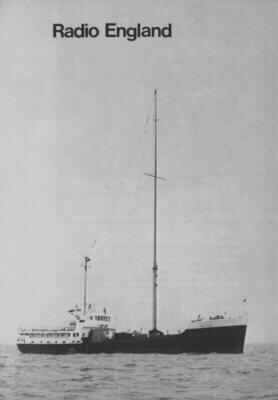 Radio England began test transmissions on 3/5/66 on 355 metres, 845 kHz, and moved to 227 metres, 1321 kHz one month later. The slick American presentation and the superb PAMS "Jet-Set" jingle package created a fantastic sound which would have made the station a winner in any US city, but failed to attract the British listeners. 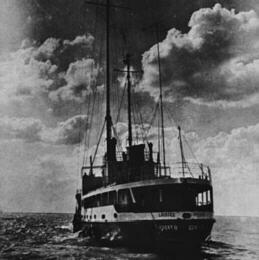 In November 1966 the station was renamed Radio Dolfijn and given a Dutch format. The name was changed again in March 1967 to Radio 227, still trying to capture the Dutch market, but did not succeed, and the station closed down at 18:00 on 21/7/67. Swinging Radio England and Radio 227 are well represented in The Museum of Commercial Radio. 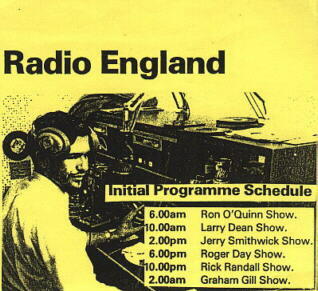 Radio England Initial Programme Schedule. Radio England studio with Larry Dean on air. MV Laissez-Faire at anchor off the Essex coast.